9 April 2019 – Surfers no longer need to travel to the other side of the world just to ride the waves at some of the most renowned surfing destinations. 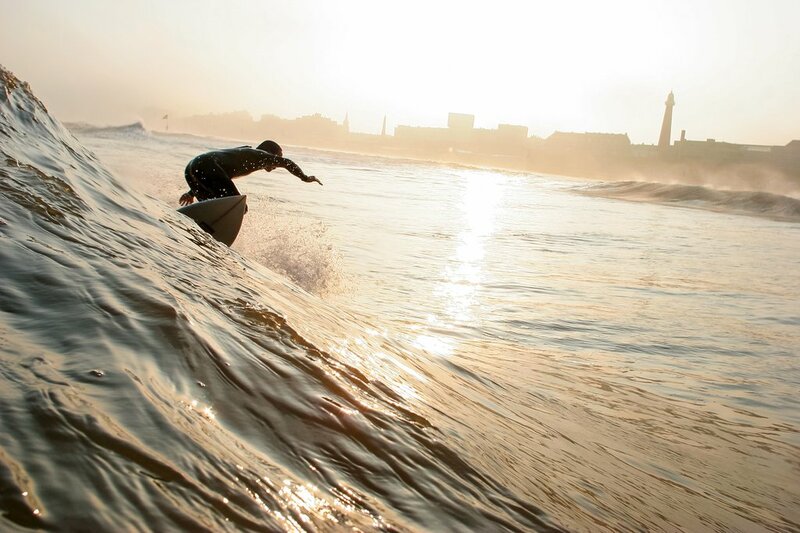 Water lovers can now uncover some of Europe’s best surfing spots with Stena Line. Unbeknownst to many, The Netherlands and northern Germany offer great alternatives to classic surf locations with their incredible beaches, surf schools, watersports and even Windsurfing championships. Stena Line offers two daily crossings from Harwich to the Hook of Holland from £59 for a car and driver to start exploring some lesser-known regions. What’s more travelling by ferry allows passengers to bring their surfboard with them. Book now and choose from a day or overnight ferry to start the adventure. Surfs up! www.stenaline.co.uk/ferry-to-holland. When it comes to surfing travellers needn’t travel further than the port itself, as Hook of Holland offers one of the best scenes in the Netherlands. The beach and waves alike attract plenty of tourists due to the warm weather and strong breaks. With five surf schools to choose from surfers can become a pro in no time. After a hard day’s work on the water, unwind at De Pit beach pavilion for a bite to eat or a much-earned drink. Undoubtedly home to Holland’s best surfing spot, the beach of Scheveningen boasts a wide range of surfing facilities, surf schools, shops, bars and restaurants; a real surfing haven. Located only 24km outside the capital city, Holland’s most famous beach resort includes an artificial reef, a pier, a harbour and a lighthouse. Scheveningen attracts lots of tourists ready to hit the waves or chill and sunbathe. The Pier also has both a zip line and a bungy rope for thrill-seekers wanting to end their beach day with an unforgettable experience. The Wadden Islands on the Dutch coast are little known to visitors from the UK but very popular with Dutch nationals for its long sandy beach. Those travelling as a family can take advantage of the schools such as Surfschool Texel which offers lessons to both children and adults. The beach is also ideal for active and adventurous travellers with its cycle paths around the island and the dune landscape. Or, after mastering the waves why not tuck into a picnic. One popular location is the long stretch of beach by the Texel lighthouse. Part of the North Frisian Islands, Sylt is famous for its distinctively-shaped shoreline, top-notch cuisine and array of watersports. Those visiting the area between 27 September and 6 October should check out the Windsurf World Cup, which includes after-surf parties and late-night windsurfing sessions. Apart from windsurfing, other watersports options available here include stand-up paddling, sailing, surfing and kiteboarding and both long-term enthusiasts and beginners are welcome on the island. Head to Südkap Surfing school, with locations in Wenningstedt and Hörnum, to learn the ropes in every discipline. Sylt also has a buzzing night life, centred in Westerland and Kampen, which caters to tourists and locals alike. Try Club Rotes Kliff in Kampen, Meerman in Hörnum, Cheers, Prime and Thommy’s Musikcafé in Westerland. Considered to be one of Europe’s best beaches, Germany’s Warnemünde is often called “White Beach” due to its white sandy beach. Here holidaymakers can enjoy Caribbean-like temperatures of up to 35 degrees Celsius and deliciously warm waters. In addition to surfing there is plenty to do such as scuba diving, windsurfing and other water sports. Those heading down during 6 and 14 July can look on the Warnemünde Week, one of the largest international sailing events in Germany. For those who want to soak up the sun, explore the culture or savour the local cuisine, travellers can visit The Teepott as well as other local landmarks such as the lighthouse, before eating lots of scrumptious seafood whilst watching live musicians serenade diners and onlookers. Every year more than 500,000 people cross the North Sea, between the UK and Holland, with Stena Line the largest ferry operator in Europe and one of the largest in the world.